Hi everyone. In the interest of time, I did the thrifting "group shot" instead of the nice-nice individual pics. It's great to do the blog on a weekly basis, but I'm starting to realize we're spending too much time on it and not enough actually work on the shop(s). May shift to twice a month instead... we'll see. Starting on the left in front, an unusual looking red vase with black lines from Metzler & Ortloff. I hadn't known about this German company at all, but I got some help when I posted the mark to #thriftbreak on twitter. Company has been around a long time, but I believe this one is from the 60s-70s. I actually thought it was from Japan when I first saw it. Right in back of that red vase is a simple stoneware vase - it's marked "Peterson 1979"... there's an initial in front of the Peterson that looks either like an "E" or a "J". I'd thought it might be Greta Peterson (Peterson Studios, did work for Jaru), but the style doesn't look like hers. Anyone have a clue? There's also a Susan Peterson who did stoneware and wrote a few books on ceramics, but it doesn't look like her sig. I was so excited to find the Arabia Kaj Franck kitty pitcher in the wild. I've only found a single "cow" pitcher while thrifting, and we've been looking for a long time. Unfortunately, when I got home I realized it had a small hairline on the rim - so we may end up keeping it. The tall green glass pitcher in the back is from IIttala in Finland. I'm not too sure on which line it is, but it has the IIttala sticker on it so I had to pick it up. It seems to be from Timo Sarpaneva's "I-Series" (I-Linja) line, though I'm not 100% on that - there's some conflicting info online so need to read up more on it. Some have it listed as being by Erkki Vesanto. 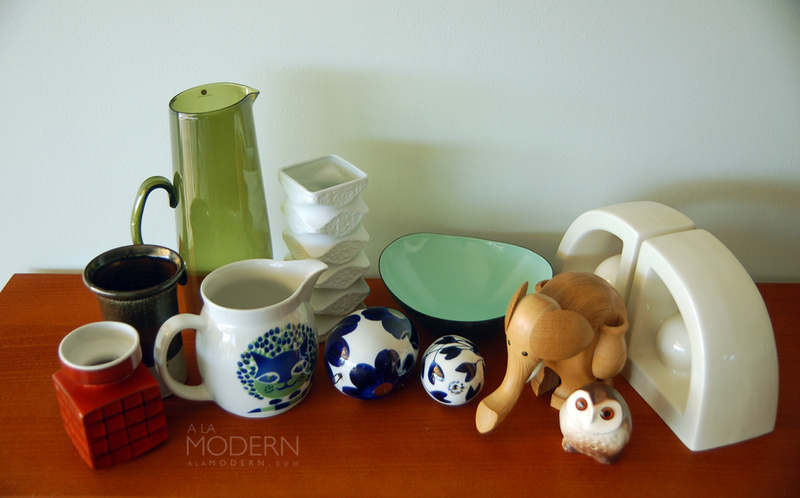 (BTW, thanks to joeposch on #thriftbreak for the help and discussion on this). The matte white op-art style vase to the right of it is also an unknown, though I'm pretty sure it's from West Germany. I was thinking either AK Kaiser, Hutschenreuther, Rosenthal or Schumann Arzberg. I haven't done the research yet, though it's interesting because all of those companies usually mark their wares, but this one has no marking other than a number. The two "egg" ornament thingies in front are Arabia Finland pieces. I know I've seen these listed somewhere, but I can't seem to find the reference online. From the writing on them, I think the line is "Atelje"(?) and they're by Gunvor Olin-Gronkvist. Anyone know more? I found yet another wooden Bojesen-style elephant at an estate. This one is significantly bigger and seems to be made of a different type of wood. I'm still curious what the story is on these things - pretty sure this one is a newer model though. The little owl in front of the elephant is another Roselane "Sparkler" piece - might've been distributed by Hagen-Renaker. Lastly, I had a bit of buyer's remorse picking up the gigantic white bookends. They were unmarked but I recognized them instantly as being Jaru Art Products pieces. I've been trying not to pick up large heavy things, but certain pieces of Jaru can go for a surprising amount on Feebay - regardless of how "80s" they look, haha. OK, probably see you in two weeks - happy thrifting! Hi everyone. Going to get a jump on posting our finds earlier, as we've got a busy weekend. We had a tougher time at the thrifts and estates this week. The estate sales were especially disappointing - and EXPENSIVE! You probably have similar estate companies - you know the ones that "salt" their estate sales with items they bring in from their retail antique store. Or, if they're actually from the estate, the price is sky high. At this one estate sale, I saw a Museum of Modern Art hippo replica for $60... they regularly sell for $5-10 on Feebay. But enough complaining - I know that estates are a toss-up, which is why we prefer thrifts. Thrifts are a toss-up too, but at least you don't have to line up at 7 in the morning, and fight with all the "professional" re-sellers. 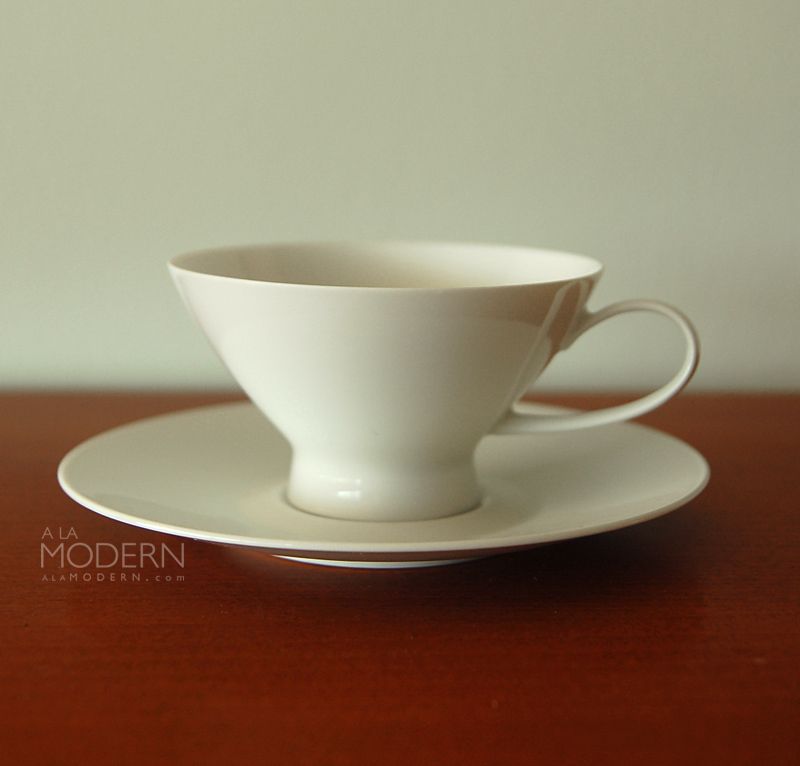 I picked up this Rosenthal Form 2000 cup and saucer set last week, along with several bowls and plates in the same line. It's a Raymond Loewy design, very delicate and graceful. I considered collecting this line for use actually, but right now we just can't think too much about it. 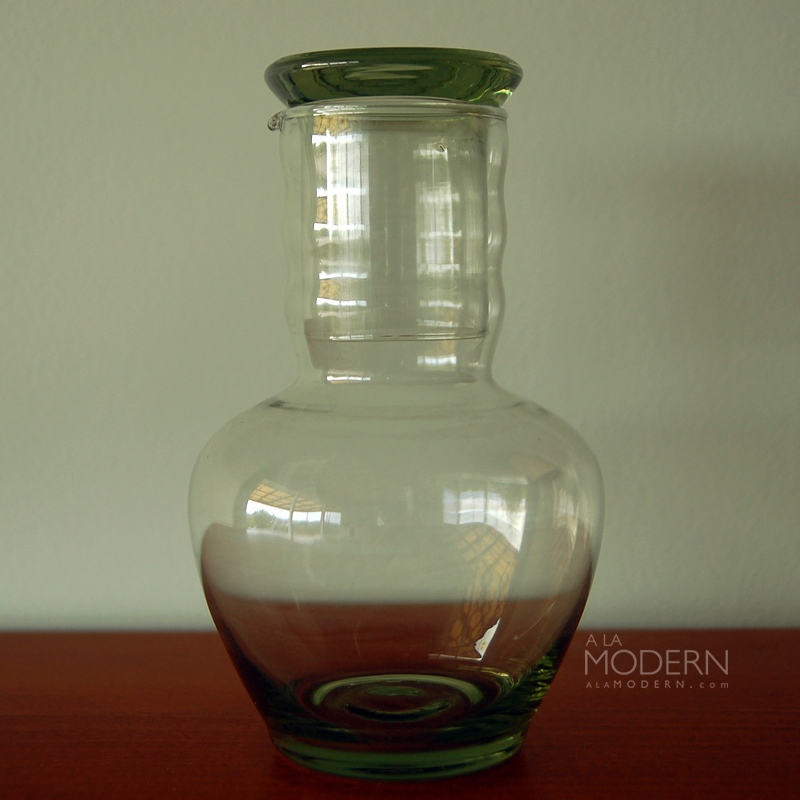 Anyone happen to know who made this unmarked decanter? It caught my eye at the thrift, even though I thought it might be new, or maybe from a company like Libbey. The little cup that acts as a lid on top is sort of interesting. The shape also reminds me of one of the newer Dansk pieces. After purchasing it, I saw an identical one without the lid at the next thrift I visited - so I'm guessing it's not that special. However, this unmarked decanter WAS special.. that was pretty clear right away. 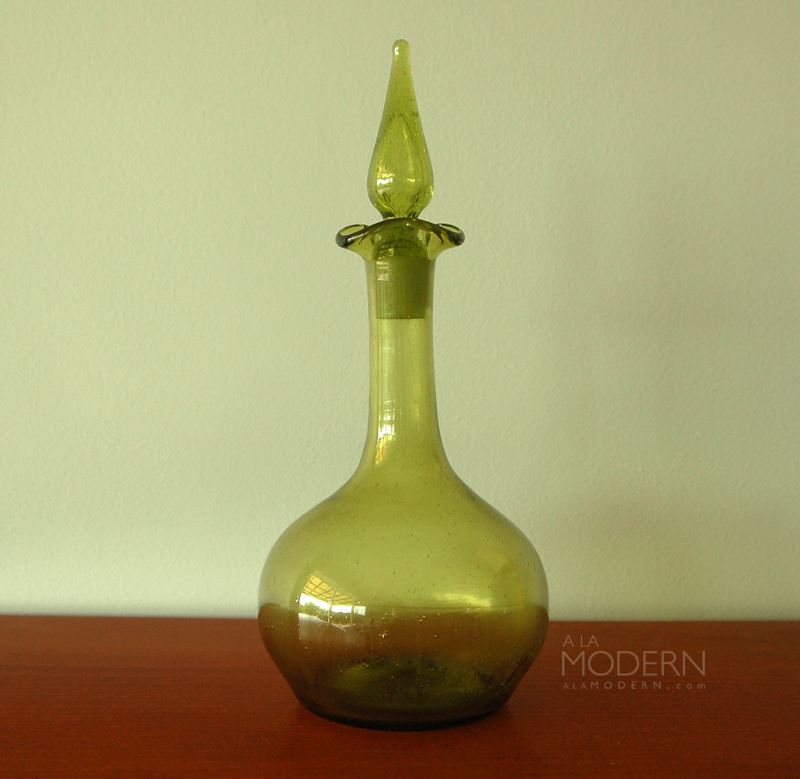 A bit thank you to Sputnikmoss on the #thriftbreak twitter crew for helping to identify this as a Blenko #37 decanter. It seems to be the Chartreuse color which would date it 1948-1955. I wasn't going to tell this additional part of the story since we're going to sell this, and I didn't want to gross people out - but there was an enormous horse fly stuck on the inside bottom of the decanter! I think that might be why it'd lasted so long - it just turned people off. At the register, I mentioned to the clerk "Hey, look - I got a bonus with my glassware." With a straight face, he said, "No extra charge for the fly," before laughing. This little Kay Finch owl was also unmarked. In fact, most of what we've been finding at thrifts have been unmarked pieces lately. It's come to that - due to increased competition, these tiny little bits of knowledge that were just "useful" before have become essential in order to find inventory for us. The owl actually has a name - "Toot". I recognized it as a Kay Finch piece immediately from the Chipman book on California pottery. 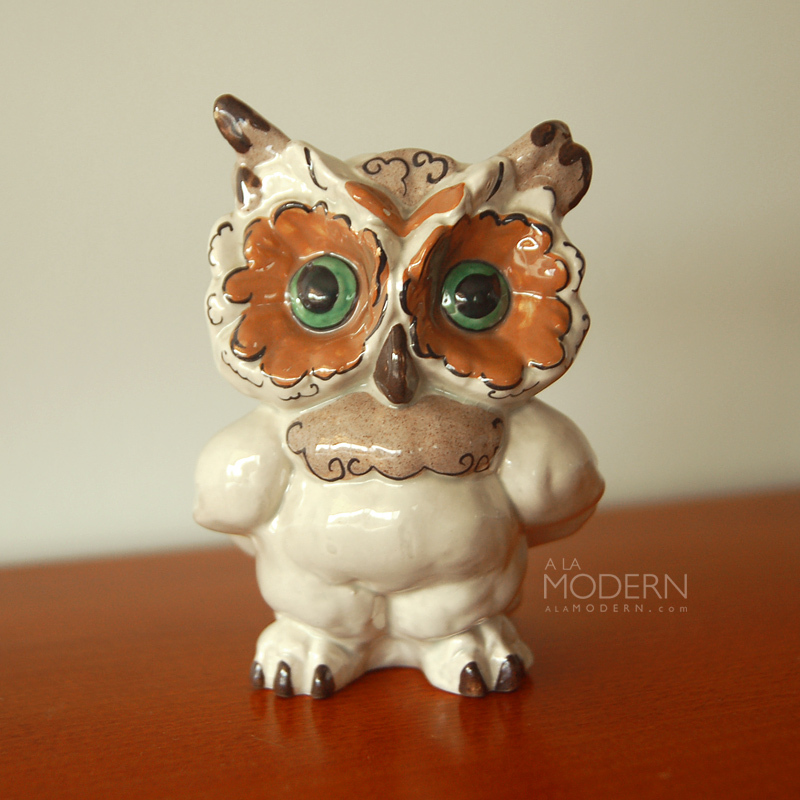 He has a bigger brother named "Hoot", and also Freeman McFarlin re-used some of her molds - so you'll sometimes see this owl in gold leaf. I thought I recognized this form as Pacific or Bauer, but the weird blue with tiny white spattered glaze threw me off. I see that type of glaze on new items all the time, but I figured it was worth taking a chance on. Turns out it's a Pacific Pottery ball tumbler, probably in the #419 size. 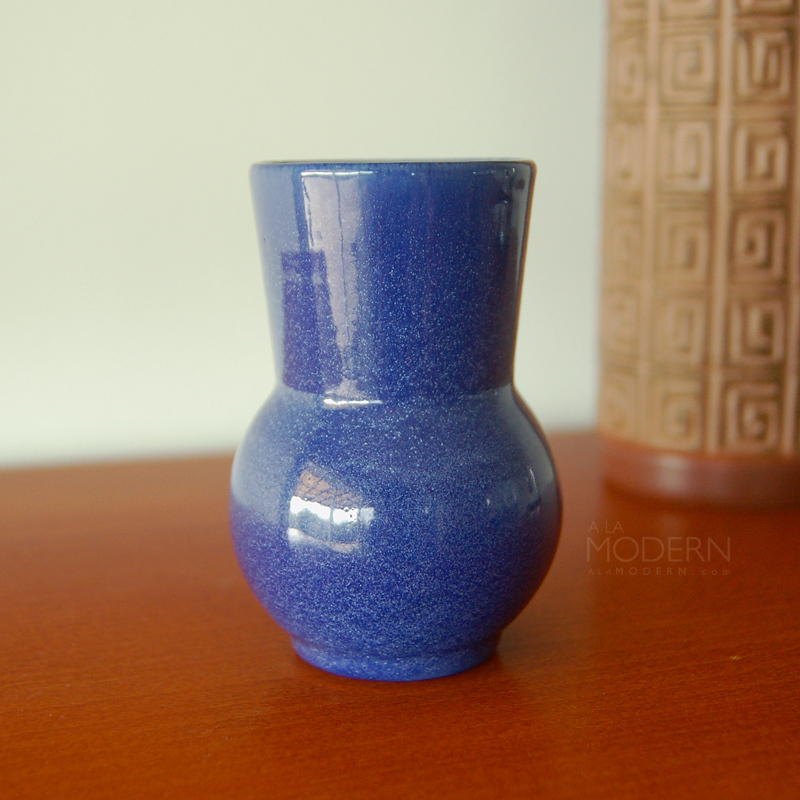 Thanks to Vintage Scapes from #thriftbreak for helping nail down the ID on this one. 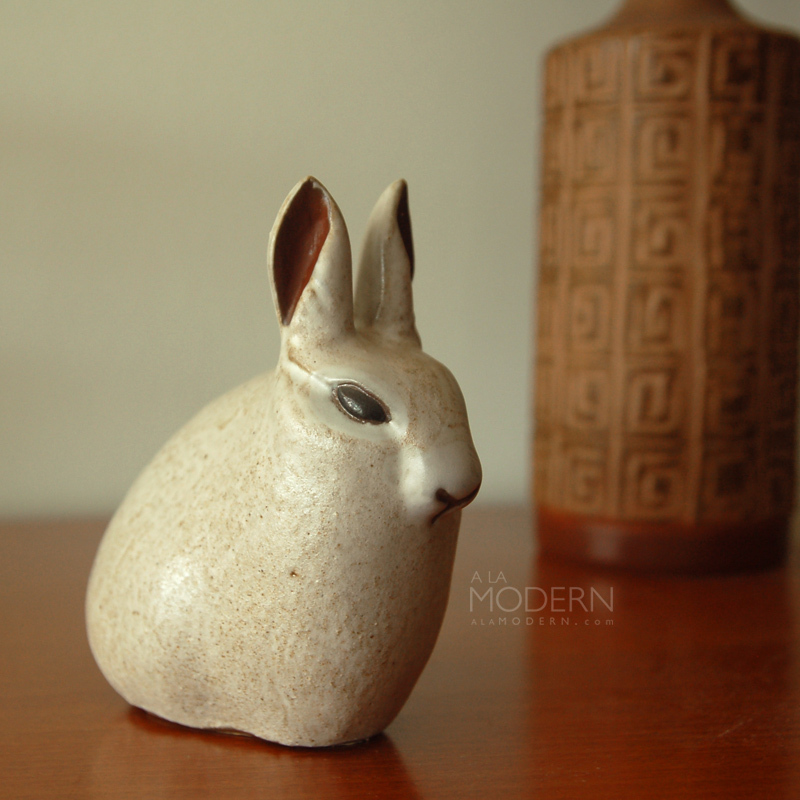 Lastly, I grabbed this little rabbit figurine because I thought I recognized it as an Andersen Studio piece. The bottom felt covering was glued really securely on, so I wasn't able to remove it and check for the conjoined "AD" mark. When I got home, I was able to scratch off enough of it to see that it was indeed there! Andersen Studio has been making ceramics like this since the 1950s, and is still active today. Happy Cinco de Mayo and Happy Thrifting!